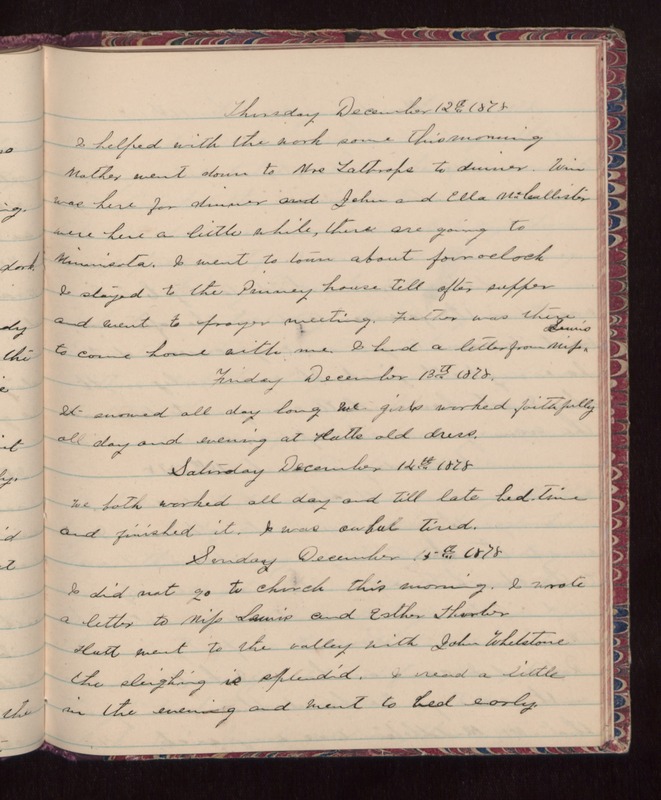 Thursday December 12th 1878 I helped with the work some this morning Mother went down to Mrs Lathrops to dinner. Win was here for dinner and John and Ella McCallister were here a little while, there are going to Minnesota. I went to town about four oclock I stayed to the Prinney house till after supper and went to prayer meeting. Father was there to come home with me. I had a letter from Mifs Lewis Friday December 13th 1878. It snowed all day long We girls worked faithfully all day and evening at Hatts old dress. Saturday December 14th 1878 We both worked all day and till late bed time and finished it. I was awful tired. Sunday December 15th 1878 I did not go to church this morning. I wrote a letter to Mifs Lewis and Esther Thorton Hatt went to the valley with John Whetstone the sleighing is splendid. I read a little in the evening and went to bed early.